Tom Hood was a wonderful guest on today’s show. He’s a great forward-thinking leader in the CPA world and delivered great value to the audience with his insights into technologies and trends for the future. Tom just returned from a spring council meeting for members of the American Institute of CPAs. A big takeaway from the meeting is the sense that people are beginning to understand the impact of the exponential pace of technology. Big changes like continuous auditing of 100% of transactions are right around the corner, as well as automation within the financial world. Big ticket items will still remain with professionals, but the entry level tasks will be moved to machines soon. “We’re going to need new skills and need them faster probably than we think and we’re going to need to focus on things that computers can’t do.” The trust and relationship side of accounting are aspects that we need to leverage: we need to get better at doing what computers can’t do. Tom has been able to predict many of the things that others are just now starting to see. It’s not any type of clairvoyance on his part, though. He attributes his future seeing abilities to something that Isaac Newton had said, “The reason I can see farther is because I stand on the shoulder of giants.” Tom’s business relationships and training has helped him see upcoming trends. The number one reason why people leave their CPA’s is because they tend to be reactionary and not proactive. Accountants are logical and we look for facts to understand and tell us about the business. This can lead to a focus on the rear view mirror, without ever looking out through the windshield. CPA’s need to make time for the future and must be taught to look forward. Tom gave some incredible food for thought in today’s episode. We all need to make a concerted effort to be more forward thinking in our approach to our chosen profession. I’m really glad he had the time to speak with us today. Pete: Tom, thank you for taking time out of your extremely busy schedule to spend a conversation with me on my podcast. I can’t thank you enough and I greatly appreciate it and welcome to Improv is No Joke. Tom Hood: Pete it’s a honour to be here with you so I am excited to be with you. 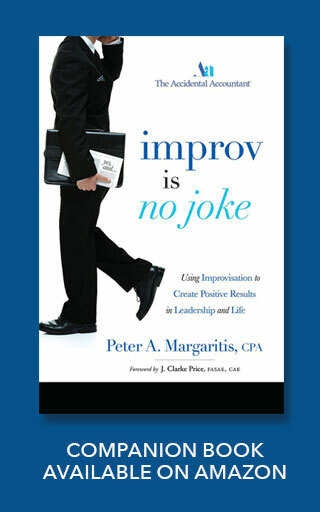 Pete: Prior to us recording this Tom is on the road a lot and travels throughout the state of Maryland and as well as nationally in his role as CEO of the Maryland Association of CPA’s and the Business Learning Institute. But he just got back from AICPA’s Spring Council and what can you share from that council meeting that this audience who will contain CPA’s, what can they take away from what you saw at this conference, council meeting, excuse me. Tom Hood: I think the council meeting really emphasized a couple of key areas which I think are big opportunities or potential disruptions depending upon how you look at them. But certainly the pace, the exponential pace of technology and some of the big changes that that’s bringing was an overarching theme. There were several key speakers that addressed that area. Related to that is the era of big data. So certainly what technology is bringing is the need for analytics on lots and lots of data. So there was a big piece of that. The third piece I think would get to firm culture and strategy and what firms need to do and there is a great presentation by [Mark Cosio on PCPS , Barry Melonstouger 1:38] referenced some of that and it is keynote. And then they had a deeper dive into the diversity and inclusion initiative. So I would say those were the big items going on. It was pretty interesting. It was a very good council meeting I thought. That’s what everybody said. Pete: What was one of the biggest things, biggest takeaways that you have got from the council meeting? Tom Hood: Well I think it was a sense that people seemed to really understand how impactful this exponential pace of technology really is and you know there were some people there that were really you just kind of hear a buzz in the room as they talked about what’s that one of these computers are actually doing. And then later there is a talk that you know auditing, continuous auditing and the ability to audit a 100% of the transactions is not that far into the distant future. Actually could be a couple of years away. Tom Hood: I think that everybody was touched. Pete: I never thought about that way that a 100% auditing with cognitive computing could be, actually could occur. Tom Hood: Yeah. I mean they had a guy, one of the last speakers, was from, I don’t know if he was directly with IBM but at one point he was with IBM in the IBM Watson project that he was talking about all kinds of things that Watson is doing and that is on the heels of the KPMG Watson deal. Not too long ago that was announced. That really talked about this you know the age of cognitive computing, all the big four have similar projects but literally they were saying that they could feed [wards 3:19] in a 100% of the contracts in a public company and they could like read them in minutes where it would take a team of auditors to you know forever to try to do that. Pete: That is a, that’s kind of a disruptive business model for the accounting profession. Tom Hood: Yeah I think you know the notion is and this is kind of my view, so it’s funny Barry had a couple of views on there. There is a book out right now called “Future of the Professions”. I don’t know if you, if it’s come under your radar. Pete: I haven’t seen it yet. Tom Hood: It’s one of like [Robin Bakers 3:51], one of my buddies, he always, he thinks it’s one of the best books there is. Anyhow it’s by a father-son from England and they basically talk about the end of the professions, plural. So they talk about legal, medical, accounting, architecture, any of those and they paint a pretty dystopian view from that perspective. Others have said you know there were all the routine, basic analytical, things that can be rules based, a cognitive computer can handle but there would still be a judgement and critical things and obviously trust and the emotion side that computers can’t do. So you know the message I think from all this is we are gonna need new skills and we are gonna need them faster than probably any others think and we are gonna need to focus on things that computers can’t do. And certainly I think from CPA perspective you know the trust and the relationship side it’s always been a cornerstone of our profession, is an area that we can leverage. But the bottomline is that those entry level things you know the ticking and tying and auditing and some of the basics, a lot of that is gonna go to the machines. Pete: You’ve been talking about this for quite some time and you got my attention early on as relates to the book “The Second Machine Age” and then I turned you on to the book ‘Humans are Underrated’ which talks about this cognitive computing. But you have been talking about this for a while. How does it feel that, the visionary that you are, that other people are now starting to see what you have been seeing? Tom Hood: Well I think, I don’t know that, so I like to say that it’s the Isaac Newton quote, “The reason I can see farthest is I stand on the shoulders of giants.” I guess I am fortunate in that between the folks we work with in the association, people like you, that are on our BLI thought leader team and my, you know my network with a bunch of thought leaders around the country, you actually do get to see a little further ahead and I guess it’s been my mission to try to help our profession see further, see around the bend a bit so that we don’t get destructed. Because that’s the last thing I wanna see happen. So I mean it is kind of neat that we are starting to see people get it and begin to say, “Now what can we do about it?” So I do think that’s kind of cool. Pete: That is kind of cool that they are starting to see this and you are talking about what can we do that computers can’t and it’s the three C’s: communicate, collaborate and be creative. Tom Hood: That’s exactly right. Tom Hood: That’s absolutely right, absolutely right. Pete: But the skills that CPA’s will need in the future, what additional skills do you think they will need outside of just some of the basic analytical pieces? Tom Hood: Well I think you know, it’s funny because I was talking to one of the chief [appointing 7:35] officers in one of the big four just the other day and just kind of asking you know him like what do they see and what’s, what are they thinking about. And it’s funny. The number one thing that came up from him was just consistent with all of our research, is strategic thinking. Tom Hood: Right so because I was talking about the notion of data analytics so you know the fact is the whole idea of understanding data and being able to analyze is critical but that comes with actually if you want to add another C to your three C’s, it would be context. Tom Hood: Yup. Context. Because that’s what we mean by strategic thinking. Pete: Could you give me an example of that? Tom Hood: I love it. Tom Hood: Cause context is what’s going on around you. Right, so if you think about wisdom, wisdom is really looking at patterns and connecting dots. Tom Hood: If you think about what makes CPA’s valuable in many of the disciplines they are is it they have this deep understanding of a domain. That’s context and they can neck that domain to another domain’s problem and help solve it. Now that’s even better. Right? Tom Hood: You learn from manufacturing and apply it to retail sales. So the context is really understanding the business and the broader environment of the business. It’s like what’s going on around the business so that you can understand what part of the data might be really important. Pete: So they would, so well let’s take a CFO. A CFO would need to truly understand all aspects of the organization such as sales, customer service, IT, HR and understand how that operation runs, not just the financial information or the analytics but just some of the idiosyncrasies of each department. Will that be along these lines? Tom Hood: Yes, exactly right. I will give you a great example. This past week we had our business initiative conference and we had the Vice President of strategy and finance from Pixar. Tom Hood: Through every step of the process. That’s context right? Pete: But it’s just teaching or informing the accountant that the importance of the context because when you say now looking forward and looking into the future. But if you think about financial reporting, that’s all about history, it’s about yesterday,not tomorrow. So how do you change that mindset? Tom Hood: Well I think that, I mean that whole piece of moving to the notion of windshield and get away from that rearview mirror, I mean that’s absolutely critical. By the way that is the number one reason that clients leave their public accountants is a big reactive, the reactive versus the proactive is also one of the top challenges we are seeing consistently across the entire accounting CPA domain. You know I think to your point Pete, It’s about making time for the future and teaching them how to look forward. So you know we have been working with this futurist [Dan Burrus 12:17] on how to start thinking about anticipation, how to understand emerging trends, what can you predict. He has a whole methodology called ‘hard trends’ to say there are things about the future you can predict and if you hang your hat on those, the risk goes down in your life and success goes way up. So if we could, you know CPA’s are very logical people. What we found when we exposed them to this is that they get bolder because CPA’s like the one with facts. The difference is instead of historical fact, it’s a future fact. And suddenly they go, “Okay I can get my arms around that.” and so that we see them become more creative and we see them become more future focused. The other thing that I think you said earlier, idea of creative collaboration and communication is the collaboration piece. I believe that we are at an age now where the collaboration curve is going to be more important than the experience curve. Pete: Like I always said that the collective knowledge inside the organization is far less than the collective knowledge outside the organization. Tom Hood: Exactly. And yet a lot of CPA’s are so busy doing the current stuff that they are not getting outside to do that. Pete: Because I keep thinking about they are starting to see the light bulbs coming on, they anticipate, anticipory CPA, I mean anticipating to CPA seems to be like an oxymoron but I say what key skill would a CPA need to develop in order to: one, to be able to look out into the future, two, accept that there is going to be risk when a lot of us, lot of people in the profession are very risk adverse and three, if I don’t do this I might not have a job or I may not have a firm anymore in the not so distant future. Tom Hood: So I think there’s two pieces. One is what skills do I need to be future focsed. Right? Tom Hood: And really, see I think the beauty is the CPA has got the disciple of accounting, they understand business, the language of business. So now it’s a matter of saying, “What can I be doing to be more predictive and think about what’s coming at us instead of just what’s happened.” So it is a mind shift from that perspective. The next part of that is how do I understand trend. So the CPA.com did a future ready study, may be it’s about a year, almost two years now and hiredd a guy to basically assess it and only 8% of CPA’s themselves said were future ready. Now what does future ready mean? Future ready is the ability to predict and adapt to emerging trends and issues and business, social, economic, political and technology. You have to get a knowledge context of what trends are, what they might mean and you have to begin to say, “How am I going to keep my radar longer and wider, looking for those and how do I begin to sift and filter those things.” And the financers can teach that. And when you throw in with [Dan Burrus’ 15:33] research has been, he uses the discipline of hard trends. He says there are really only three, I guess you could argue four if you add globalization but technology, demographics and regulation. So once you, that’s the narrow you know kind of your stoke narrow, so now you could start to dig into those. I mean demographics, it’s kind of a blinding flash. It’s obvious. But we all know how old everyone is today and we know how old you will be tomorrow. Tom Hood: Right? I got a whole bunch of firms call me up go, “I need one manager.” I will be like, “Unless the spaceship lands and releases them, they are not there.” There is like physically, there is not many of them and it’s a finite resource. Right? It’s not gonna, you can’t create a 35 year old in a day. Tom Hood: So you know but it is funny because why we laugh at that. How many firms, how many organizations, how many even like governments have not planned school districts because they needed to look at demographics? Tom Hood: So it’s like getting, so there is a, basically there are just some simple things that you could begin to learn that helps put your head around that stuff, then you have to get those other skills like creative, like strategic thinking, you have to start to but you can learn those and we do a bunch of things that teach those. I mean you’re involved in us helping teach some of those stuff to CPA’s. Like what did you see, what’s your thinking about that? Pete: It’s fine but as it goes to crew well I’ll backup. You said something a moment ago about we know the language of business and it is a language. It’s a language like Japanese, it’s a language like Greek, it’s a language like Chinese. And most people who are not accountants don’t understand our language. I use the example when you say depreciation to a non-accountant, they go, “Oh that’s the value I lose in my car when I drive rough in a new car lot.” And the account looks and goes, “No, no, no. That’s a systematic allocation of an asset over time.” And ‘Ooh’ Scooby Doo comes out. So I think one of the things with the audiences that I am, I am fine when I say we have become better translators, we have to take the complex language of accounting and put it into a context that our audience can understand first and foremost. As we are working our way throughout the organization, understanding the different pieces and parts of stuff, what we have to get away from accounting speak and speak a simpler, more common language in order to increase the understanding. That would be a one. Number two, you know I have a course How to Dump SALY, same as last year and fun and new creative way. Pete: I think from that point it’s just one, get it into the point that they do see themselves as creative and in creative confidence by Tom Kelly, in his book he mentions about the best way to become creative is to think that you are creative. Exercise that creativity muscle. 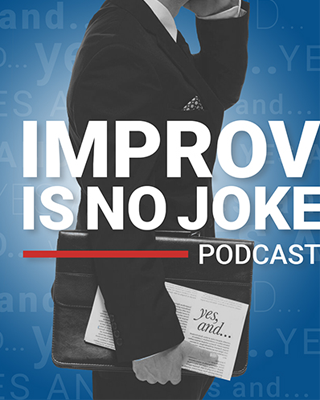 So when someone tells me, “Yes but I can’t do that.” or gives me the reason, the improv guy comes and says, “Yes and here’s why you should be doing this.” Yes and don’t stop yourself, continue to learn, push yourself, open up other opportunities. The more and more that I matter to find this audience, I am starting to see the light bulb go on and as evidenced by their reaction, them embracing these ideas as well as seeing class sizes increase. I am seeing the change and it’s a slow change but I think that’s the part that worries me a tad bit, it’s a slow change and I think this change needs to speed up for the good of the profession. Tom Hood: Yeah. I would completely agree with you and that notion that let’s face it we are dealing with this idea of exponential change. So that’s the, I think that’s what you know you were talking about, that’s what I certainly worry about. So I think you know well I had hope from this AICPA conference that I started to see things happening in that perspective. People really focussing on this pace. I think you know as a profession we’ve always been able to adapt. The question is can we speed it up a bit to catch up with this and then you know get a handle on it. Right? Pete: Right. The other side that I think about is you know, the accounting programs out there are full of students and they are coming into the profession but I am thinking about that sophomore accounting student at whatever university, by the time they graduate what we have taught them in the classroom will that even translate to the work environment? Tom Hood: Well they are already talking about that and I think you know they were saying that you are at a point now where in half life of a college degree literally is gonna be two or three years and literally by the time you start college what you learn will be completely obsolete by the time you graduate from college. Pete: Exactly. And even though what they do teach us in University gives us a, somewhat of a foundation of accounting, understanding the balance sheets, income statements, debits, credits and all of that and helping us pass the CPA exam, it falls short on some of these other skillsets that we are saying that CPA’s need that really should be part of the accounting curriculum. Tom Hood: Absolutely. I mean, I think there is some movements to try to change that from the academia perspective and then the other part quite frankly teaches that the employers are gonna have to pick up the pace too because it’s gonna take a while for education higher ed to adjust but so what that means is you are gonna need to make up for that gap inside your firm in your company. Pete: Yeah and having spent some time in higher ed and academia, I know they can turn a battleship on a dime. And they are not quick to change. So yeah it is gonna fall on the employer and I guess the next, my next status relates to that is hopefully that employer whether it’s the firm or organization having to provide learning in these new skillsets, that they look at this as an investment in the organization, not a cost of doing business. Tom Hood: Right. It’s true. Pete: I think that’s out of date thinking. Tom Hood: Excellent question. I mean I think it’s the old, if we train them, the will leave and the corollary is what if we don’t train them and they stay. Pete: Stay. exactly, exactly. So you know I think we have as a profession a lot on our plate to look at and to be prepared for because as you said things are moving in such a rapid manner versus you know I remember when I had an eight track player, then I went to a cassette player, it just seemed, but now we are going quicker, faster. What I read the other day Uber is looking at purchasing driverless cars for their fleet in the future. So it’s real and in front of us. Any other thing, any other big takeaway that you got out of council? Tom Hood: I may, I think the other part is I think there were certainly the AICPA, many state societies, other groups. So I think the beauty is there is as a profession we are start to work on and think about this. So there are some resources that people are working on and trying to help facilitate this. I saw the institute basically make a call for leadership saying, “We need new people in council to be leaders and help guide this profession through this big, giant shift change.” and so that gives me hope when I see that kind of stuff. Pete: Yeah. Well you can pass this along to Barry, being a former council member and really see this issue. I am willing to help out anything which way I can. Tom Hood: Awesome. Well, I will you know right now they have got, they are rolling out like their own kind of resource type thing around this stuff but I think the bottomline is that to spread the message , training people in the new skills, some of those kind of things that you are already doing Pete, is the kind of stuff that we need to keep doing. Pete: Well, I thank you and I thank BLI for the opportunity to put me in front of a wide variety of audiences and I will keep carrying the flag. Tom Hood: I hear you. Let’s do it, let’s do it. Pete: So not to take up too much more of your time but I, something I just instituted that, I don’t remember Tom, are you a golfer? Tom Hood: Not a good one. Pete: Not a … so we should play cause I am neither. I am not a good one either. But this morning I was watching some old episodes of David Feherty show on the golf channel. I love the Feherty but he was interviewing Nick Saben and he did a rapid fire segment where he asked him these questions just kind of you know get to know the personal side of the individual which I thought was really fun. So I would like to do a quick 10 question rapid fire session with you. So maybe you get a different perspective or get to know you just a little bit better. You up for that? Tom Hood: I am up for it. Pete: Okay. You’re a little nervousness in your voice there for a second? First one is Jimmy Fallon or Johnny Carson? Pete: Jimmy Fallon. That’s a tough one for me because I am an old Carson fan but I will tell you Fallon has really done well. Pete: The Baltimore Ravens or The Washington Redskins? Tom Hood: Definitely The Ravens. Pete: The Ravens. Bruce Springstreen or Pearl Jam? Pete: I was hoping, just so the audience know, when was it, a year so ago that you went to Seattle and saw a Pearl Jamming concert? Tom Hood: Yeah. it was a, yeah it was a year and a half ago. Pete: Yeah. and I am still jealous about that. Tom Hood: It was incredible. Tom Hood: My son, my older son, he took me so it was fun. Pete: Oh wow! I will play it to you later, how that experience in Seattle with Pearl jam. What is your favourite kind of meat? Tom Hood: Favourite meat would have to be rib eye steak. Pete: Oh okay. It sounds good. Here’s a tough one. Microsoft Excel or your fingers? Tom Hood: Obviously I count much. Pete: And back to little bit of our conversation I truly believe the excel won’t exist too much longer if cognitive computing takes over as the way it looks. Tom Hood: That’s true, could be a very different world. Tom Hood: You are exactly right. Pete: Being the technology guy that you are, Facebook or Periscope? Tom Hood: Facebook live, how about that? Tom Hood: Now we have to replace Periscope. Pete: Have you dabbled in Periscope? Pete: And your thoughts on Periscope. Tom Hood: I mean I love Periscope. I think it’s you know it’s the Twitter platform. But we just did a live broadcast to a student group about becoming a CPA on Facebook live and it was really smooth and that’s why I picked Facebook for that standpoint. Pete: I will check that. I haven’t seen Facebook live but that’s after we hang up that will be the next thing I do. Tom Hood: Same day, I will be there. Pete: What is your favourite movie? Tom Hood: Favourite movie? That will be a tough one. Actually it might be Gettysburg. Tom Hood: I am a history buff and I love the, you know kind of the story behind that and they did a good job developing the people and the characters. Pete: You say you are a history buff. Are you a broad history buff or civil war history buff? Tom Hood: It’s all a little bit of both, mean did Marilyn in the middle of most of the major battles of the civil war. So it’s been part of my you know kind of my upbringing forever. So that’s a definitely special area but like you know we are for Nick Henry here [29:29] so we are immersed in lots of history right here in Maryland Arians [29:33]. So that’s what I think must have driven that you know those kids you know always end up going to these battlefields and stuff as a family trip to do stuff. Pete: Yeah. that’s cool. What’s the one song that get you motivated when you need to pick up some energy, what would you play on your iPhone? Tom Hood: I mean I got a whole bunch of them. These are like we call them like arena songs. Right? Tom Hood: One of my favourites really would be, ‘Living on the Edge’ by Aerosmith. Pete: Oh nice, nice. What would other one be? You said you have a whole, a bunch of these. Tom Hood: I mean, I like, well I like what’s it the Kristin Chenoweth on I Was Here so kind of an wise song from a heck of a lady vocalist. That would probably be another good one. Fight Song is another good one that’s kind of a more modern song. I mean, I love, I am just kind of very eclectic. I like kind of whole bunch of song. That would be, those would be some of those cool ones you get, kind of get you going. Leonard Skinner is always fine for some of those pump up songs as well. Pete: Yeah. I mean to think about because when somebody asks me that question my number one go to is “Badlands” by Bruce. But when you threw out Skinner, I can think of a few way that get me motivated as well. And the last question. Name one item that is still on your bucket list. Tom Hood: One item that is still on my bucket list. Well it definitely be, probably a great trip to Italy. That would be my bucket list. Pete: Oh I would highly suggest that. My wife and I went, has been about seven years ago and absolutely fell in love in Italy. So I would suggest that you move that up to the top of your bucket list and go. Tom Hood: I might get some tips from you when I do it. So that’s pretty cool. Pete: Oh please do because we still have a lot of stuff from there and just absolutely enjoyed the two weeks that we spent in Italy and we are Greek. And we have said it’s be a hard choice whether we go back to Greece or go to Italy. We were just so enthralled by the Italian people. Tom Hood: Interesting. That’s pretty cool. Pete: Well Tom I can’t thank you enough for taking time to spend with me on this podcast. I once again, I greatly appreciate it and thank you so very much. Tom Hood: Oh I love being on here with you. So it was awesome. Thanks very much Pete and good luck running the show.